(HARLINGEN) – Ricardo Vasquez is pursuing an associate degree in Agricultural Technology at Texas State Technical College. The Sebastian native holds a 3.6 grade-point average and expects to graduate in Summer 2019. 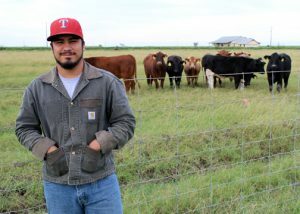 The 22-year-old said that by pursuing a career in agriculture he is following in his father’s footsteps and said his favorite part of the field has always been working with cattle. When I graduate I will transfer to Texas A&M Kingsville to pursue a bachelor’s degree in General Agriculture. My dream job is to work with either the U.S. Department of Agriculture, Texas Department of Agriculture or as a game warden. My greatest accomplishment so far has been maintaining high grades and my GPA, but I’m looking forward to graduating, and that by far will be my greatest accomplishment. The greatest lesson I have learned is that I must chase my dreams because I am in charge of my future. All of my Agricultural Technology instructors have had a great influence on my success. They have all guided me and supported me on this journey. Without them I wouldn’t be where I am today. My advice for future TSTC students is this: Do not let anyone tell you that you can’t do something. There is always a way to make your dreams come true.